Hello, I am back. How’s life there? The weather of Surabaya is so ‘naughty’. It keeps changing so fast, sometimes it’s dry, and in the other day it will be very wet. But that’s life, always be grateful what God give to us and spread the positive vibes. Sensatia’s natural, organic products are always made by hand from the finest raw materials known to the botanical world. We take pride in ONLY developing & producing 100% safe & natural, wholesome & organic products you feel good giving your family to use. In essence, Sensatia’s products were created by our family for your family. The center of the production and store is in Karangasem, Bali but they also have store in Ubud. And you (read: Indonesian) might be surprised that they also have an office in US. Yes, sensatia botanicals is a well known product in overseas, they also have authorized distributors in Japan, UK, Taiwan, Russia and Malaysia. Awesom, huh? Yeaah… and I am sure that not all of the Indonesian people especially female know about this brand as well as *nilev*r skin care product. I don’t really know about whose own Sensatia but then their main factory and the resources are in Indonesia so I put in as a part of Indonesian product. So, what’s so special about using organic and natural skincare? Ok, so first the main reason why we need to use skincare is because we need to take care of our body that God give us. I think it is a part of being grateful. In this artificial world you may find so many things with artificial component in it. And most of the artificial components have its own toxics. Preservatives is the most dangerous threat on our skincare and cosmetics today. Open this link to find out about it in detail. 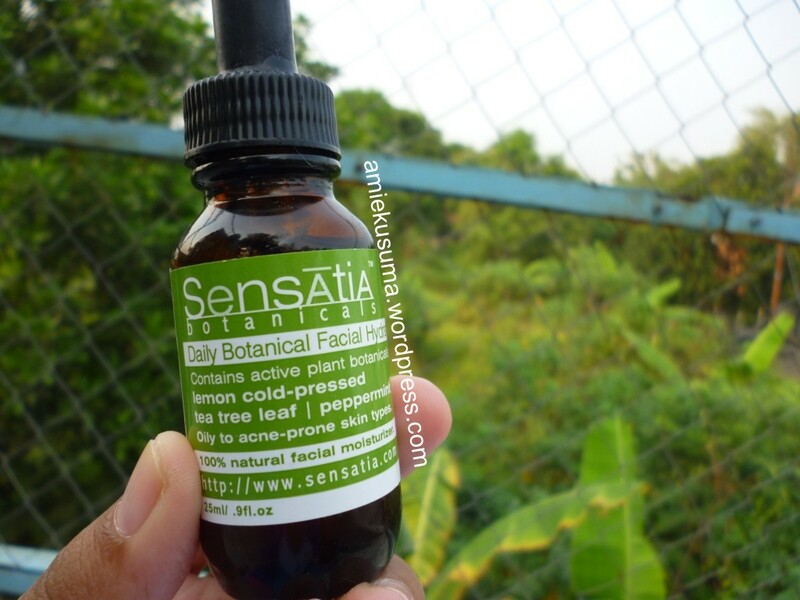 Going back to Sensatia botanicals. All the ingredients that they use were natural and organic, they use natural preservativesd and maximize the natural resources especially about the essential oils. I’ve already tried two of their products, they are facial hydrates for oily to acne prone skin and anti-wrinkle serum for 20+ year. Both of them are packaged in elegant dark bottle with small pipette included in the lid to dispense the product. INGREDIENTS: Simmondsia Chinensis (Jojoba) Oil, Melaleuca Alternifolia (Tea Tree) Oil, Triticum Vulgare (Wheat) Germ Oil, Citrus Medica Limonum (Lemon) Oil, Tocopherol (Vitamin E), Mentha Piperita (Peppermint) Oil, Rosmarinus Officinalis (Rosemary) Extract. You can see the details description and function of each substance on the website. Most of their products are based on the beneficial of essential oils. As we know that tea tree is the best remedy for acne, so I bet that this product will works very well on my skin. I use this facial hydrates as my moisturizer twice a day, and sometimes it could be my make up base. Just three or four drops are enough for my face. But you have to be careful when applying this product; make sure that your face is in dry and clean, because if it is not, it will make your face very dull. This product is so awesome. It must be the biggest enemy of acne in my skin now. When I got a big, a very big acne, I’ll just apply it and the day after, the acne will dry and we just can wait and see the dying of an acne. The scar will not completely gone, but it will reduce gradually as we apply the facial hydrates daily and doing some facial scrub. I like this product and plus I feel safe because there will be no toxics that absorb in to my skin. The only thing that bother me is just it takes time to apply it on my face. Because I have to make my face clean and dry then I have to do little massage in to my skin to make it absorb well. INGREDIENTS: Prunus Armeniaca (Apricot) Kernel Oil, Hippophae Rhamnoides (Seabuckthorn) Oil, Citrus Aurantium (Neroli) Flower Oil, Pelargonium Graveolens (Geranium) Oil, Triticum Vulgare (Wheat) Germ Oil, Oenothera Biennis (Evening Primrose) Oil, Foeniculum Vulgare Dulce (Fennel) Oil, Lavandula Angustifolia (Lavender) Oil, Tocopherol (Vitamin E), Matricaria Chamomila (Chamomile) Oil, Schizandra Chinensis Fruit Extract, Daucus Carota (Carrot) Seed Oil. As its name, I use it as my nightly serum before going to bed. Same thing as facial hydrates, I need to make my face clean and dry before apply. So, again, it will take your time. I already use it about 3 months, and I am not really sure it reduce my fine lines on my forehead. I don’t know for sure, probably it does very slowly. Well, it is part of the consequences if we use natural product, the result will not come out instantly. I think later I will try to use toner along with the serum. Ohya, remember that since sensatia use natural ingredients, so you will not smell any kind of perfume on it. But don’t worry, the smell still fine, and probably even better because it smells like traditional medicine or jamu. Fresh and Natural. All I can say is the best for sensatia’s team. Keep up the good work and keep innovate. Oh ya, I think it’s a good idea if sensatia create a product for reducing puffy eyes. ^^ I think it’s #2 enemy for all women in the world. That’s my review for sensatia, especially about facial hydrates and anti-wrinkle serum. Now I feel that my skin thanks to me because I use natural and organic and of course Indonesian product. I am proud being Indonesian. Probably some of you might ask, ‘ Is that kind of pouring oil into your oily face? Does it seems you will gain a lot of oil on your face.’ the answer is Not at all. Essential oils have so many kind of benefits and it’s called essential,, because it will absorb to your skin directly, instead of clogging your skin pore. The thing is by using essential oils you give the core food for your skin while the commercial skin care recently 90% of the ingredients is water. on my next post you’ll be surprised that oil can also be used for cleansing the face. i love your post here, but sensatia is not really a balinese product, production process does take place in Bali and some of the ingredients come from local resources (but not entirely locally grown. Some of them are still imported from australia and europe. basically it’s a global brand). 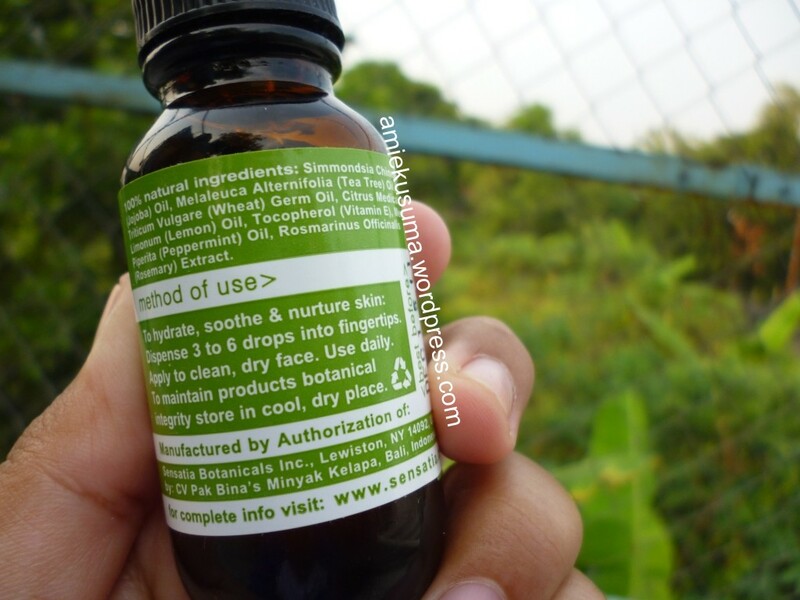 I am local indonesian, and still in the search for organic local beauty products as well. Thanks for your info about sensatia anyway. I’d like to try the sunscreen soon (saw it on their web). Have you heard about Juara skincare? the founders are four women (one indonesian), who are making range of organic skin care stuffs using not only local resources, but also Indonesia’s traditional beauty secret. Juara is produced in bali, but sold mainly in the US (but you can buy it in Bali). it has been reviewed in many international fashion magazines (bazaar, vogue, etc). Enfants Paradis, also a bali based company founded by an australian expat, also have good reviews and distributed worldwide. its local shops are around seminyak. I’ve been longing to try Indah organic (also aussie-balinese product), but unfortunately they grab local ingredients and sell it only in aussie-NZ area (arggghh.. how come they don’t sell it in Indo??? hehe :))) please do share more your recommendation on best organic Indonesian products (but not those kind of unreliable homemade things, except you have positive personal experience i will take it into consideration). I just heard Indah and Enfants Paradis from you. I will take them into my consideration for next review. Recently, I want to try Alila spa products. Actually it was produced by Sensatia but it has more variants. can’t wait to try the eye serum. I am dying to find the best eye product for me.